Last time IP FRR on Huawei routers was introduced. Let’s go on with VPN FRR today. Configure ISIS on PE1, PE2 and PE3. Configure MPLS function on all PE routers and enable MPLS LDP to set up an LSP. Configure VPN instance on all PE devices. Configure MP-IBGP between PE routers. Configure EBGP between CE and PE2/PE3 routers. Configure VPN FRR policy on PE1. Configure BFD session between PE1 and PE2. A '*' before a peer means the peer is being deleted. As we can see, a network 172.16.10.10/32, advertised by CE router, is available on PE1 in VPN instance labnario, with next hop 2.2.2.2 (PE2). Based on the traditional BGP/MPLS VPN technology, both PE2 and PE3 advertise the routes destined for CE to PE1, and allocate private network labels. PE1 then selects a VPNv4 route from MP-BGP neighbors according to the policy. The preferred route, in this example, is the one advertised by PE2. In case of a fault occurs on PE2, PE1 detects the fault of PE2, re-selects the route advertised by PE3, and updates the forwarding entry. This results in the interruption of end-to-end services due to long convergence time. Info: New Sequence of this List. Check a backup next hop address. As you can see, loopback IP address of PE3 has been set as the backup next hop. Additionally a backup label has been specified. VPN FRR ensures fast end-to-end convergence of services, in a VPN where CEs are dual-homed to a PE, in the case of a PE fault. VPN FRR technology is an improvement of the traditional technology. 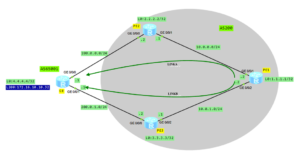 With VPN FRR, PE1 can select the appropriate VPNv4 routes according to the matching rules. For these routes, in addition to information about the preferred routes advertised by PE2, information about the second-best route advertised by PE3 is filled in the forwarding entry. When a fault occures on PE2, BFD session between PE1 and PE2 is going down. Next PE1 router detects that the outer tunnel between PE1 and PE2 is unavailable. If the LSP is unavailable, the forwarding engine uses the forwarding information of the second best route carried in the local forwarding entry to forward packets. This is how VPN FRR works. Any ideas how to achive this?